A brand new class of the small arms, the MP-7 Personal Defence Weapon (PDW) is intended to be a defensive sidearm for second-line troops, vehicle crews and other military personnel. The MP-7 was first announced in 2000, entered into production in 2001 and has been adopted by some German special units according to some sources, in addition to being offered for export sales and for NATO-trials as an another could-be NATO PDW (the only other competitor is the compact yet much bigger FN P-90). The MP-7 is designed as a compact submachine gun, with the magazine being inserted into pistol grip, and folding forward grip with retractable stock. All these features are ideally replicated in the Tokyo Marui's model and make this a perfect backup weapon, or a primary CQB weapon! Being a high performance submachine gun, the MP-7 real steel is exceptionally lightweight (1.7kg), and Marui's replica (1.4kg) comes pretty close. The gun can be fired single-handedly, or with two hands, either like a pistol or as an SMG when using a front grip. Retractable stock can be extended to give additional stability. With stock and front grip collapsed, the MP-7 can be carried like any big pistol and is super compact - perfect as a full-auto backup weapon! For skirmishes, the MP7 is great for shooting around corners and spraying your opponents to the moon! 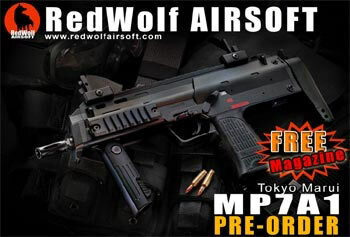 The very first batch of the Marui MP7A1s will be launched in Japan on 8th February, and are scheduled to arrive RedWolf Store one to two days later on 9th-12th. If you can't wait and want to ensure you get one of the first batches of this initially limited masterpiece, RedWolf is accepting pre-orders! Our package includes the gun, standard 50 rounds magazine, 7.2V micro battery EX and 110V EX charger. Furthermore, all our MP7A1 pre-order customers will be awarded a spare magazine FREE OF CHARGE! This free magazine offer will end upon the arrival of the MP7 into our store so hurry and take advantage of this promotional offer. What are you waiting for? Limited initial supply means that pre-ordering will secure yourself one! PRE-ORDER YOURS NOW! Tokyo Marui New Pro Sight - (TM-ACC-NPSIGHT) - Already in stock!! Tokyo Marui Pro-Silencer Short Type (14mm CCW) - (TM-ACC-PROSIL-SHORT) - Already in stock!